programs that enable people to improve their quality of life as well as their financial stability. Local women’s artisan co-op, Manos Unidas por la Mujer (United Hands for Women,) has transitioned from an educational PEACE non-profit program, to what is now the PEACE Boutique, a Mexican art distributor and social enterprise. PEACE Boutique seeks to provide artisans and cooperatives from small communities in Mexico the opportunity to sell their products in stores and markets throughout North America. 100% of generated profits are donated to PEACE, a registered 501(c)(3) non-profit organization. PEACE is in need of donations to continue this successful program. Oil, tuna, rice, beans, cleaning supplies and clothes are suggested. 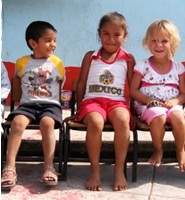 Please contact becci@peacemexico.org for drop-off locations. Provides children and adults with programs and opportunities to develop the necessary skills to be successful, positive contributors to their multi-cultural, multi-lingual societies. Responds to the challenges of the un-wanted pet population in Mexico through aggressive spay/neuter programs, education and adoption. Seeks to foster ownership and pride in the community through programs that demonstrate the importance of protecting the environment. 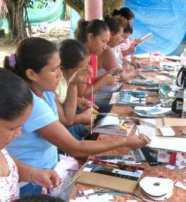 Empowers women to move toward financial independence by providing business recourses, education and training. Contact becci@peacemexico.org for information and to apply. “Everybody can be great, because everybody can serve. You don’t have to have a college degree to serve. generated by love.” Martin Luther King, Jr.
receipts in the US, Canada and Mexico. stores throughout the bay including Vallarta Adventures, Davanna Yoga, Luna Luna and Ibis de Teresa to name a few! Your year-long membership is paid for with just three tickets to a Vallarta Adventures tour! Thanks for your help, your help is very appreciated!